What Are Non Probate Assets? Non-probate assets are a special type of property that won't need to go through the probate process after you die and will instead pass directly to your heirs. Owning non-probate property is one of the easiest ways to avoid costly and time-consuming probate. Non-probate property will generally be available to your heirs within a short period of time after your death once your heirs receive a death certificate. While avoiding probate may on the surface appear to be a good result, sometimes non-probate property will end up in the hands of beneficiaries, or worse yet, creditors, you didn't intend to have it. For example, if you own a bank account jointly with one of your children (we'll call her Sue) but you have three children, and you want all three of them to inherit your property, instead the joint account will pass 100% to Sue after your death and she will be under no legal obligation to divide the account with your other two children. You also need to be aware that if Sue is married and gets divorced or has a judgment against her, then her ex-husband or the creditor with the judgment could attempt to seize the assets held in your bank account. Thus, non-probate property should only be used after understanding exactly who will inherit it after you die as well as the legal consequences of adding owners to accounts or real estate deeds. In general, there are six different types of non-probate assets which are described in detail below. Assets you own in your sole name but have a payable on death (POD), transfer on death (TOD), or in trust for (ITF) designation will avoid probate after you die. It includes Health Savings Accounts and Transfer on Death or Beneficiary Deeds which are available in a handful of states. However, if all of the designated beneficiaries predecease the account or property owner, then the account or real estate will have to go through probate. Assets you own jointly with your spouse or others, such as a child or sibling, through rights of survivorship (joint tenants with rights of survivorship, or JTWROS) will avoid probate after you die. Assets you own with your spouse in a special type of joint ownership recognized in some states called tenants by the entirety (or TBE) will avoid probate after you die. Assets owned by your Revocable Living Trust at the time of your death will avoid probate after you die. Assets that aren't owned by your trust at the time of your death but remain in your individual name without some type of beneficiary designation will not avoid probate after you die. 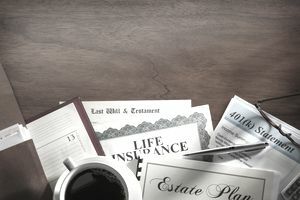 Assets in which you retain a life estate, and the remainder passes to a non-charitable beneficiary other than yourself, including real estate owned in certain states by an enhanced life estate deed, will avoid probate after you die. Assets owned by you through contract rights which are payable to a designated beneficiary after your death, including life insurance policies, IRAs, 401(k)s and annuities, will avoid probate after you die. However, if all of the designated beneficiaries of any of these types of assets predecease the account owner, then the asset will need to go through probate. When Are IRAs or 401(k)s Available to Creditors After Death? What Are the Pros and Cons to Naming A Beneficiary to Your Home Deed? How Will Probate Affect Your Tenants-in-Common Property?